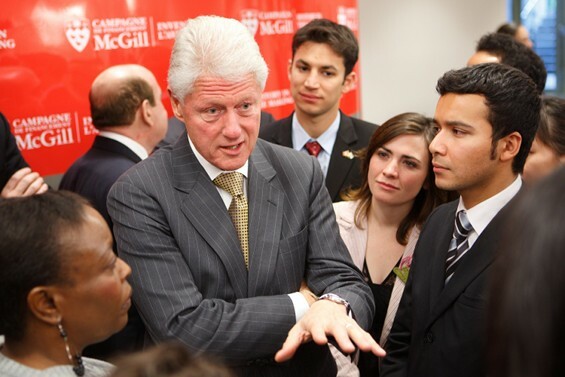 On Friday 16 October, the 2009/10 Sauvé Scholars attended a McGill University degree ceremony where a Doctorate of Laws honoris causae was conferred on former US President William Jefferson Clinton. In introducing Mr. Clinton, McGill President Heather Monroe-Blum referred to his influential work both during and after his time in elected politics – pointing to his meteoric rise to become Governor of Arkansas at the age of 32, the achievements of his Presidency, and the philanthropic work of his foundation in the years since he left office. Summing him up, Principal Monroe-Blum aptly described him as an “exuberant American original”. Mr. Clinton’s exuberance was clearly demonstrated in his address to the gathering. He often deviated from his speaking notes to regale the audience with anecdotes from his varied travels and experiences, at one point noting that “the great thing about not being president anymore is that you can say whatever you want”. Former President Clinton focused his speech on highlighting the importance of fostering a communitarian consciousness as the world moves towards an ever more interconnected and interdependent existence, and takes on challenges such as climate change and global poverty. The highlight of the day was the opportunity for the Sauvé Scholars to meet Mr. Clinton after the ceremony. The former President took time to have photographs taken and speak with the Sauvé and Dahdeleh-Clinton Scholars about his experiences in office, and his reflections on various issues in the Scholars’ home countries. He shared his vision for American action in Afghanistan with Sauvé Scholar Mirwais Nahzat, noting that what was critical to US action in the region was a humility and understanding that troops and administrators needed to back-up and support Afghans’ own efforts rather than presume to take unilateral action. Responding to James Townsend’s question about establishing access for disadvantaged groups to tertiary education in North America, Mr. Clinton noted that he was very worried about the rapidly decreasing proportion of Americans entering universities, and that the financial barriers to entry had become overwhelming for many. The opportunity to meet with this iconic leader was an honor, and Former President Clinton’s charming manner, attention to each individual, and extensive knowledge on a multiplicity of topics left a lasting impression on the 2009/10 Sauvé Scholars.